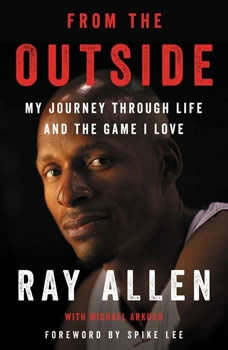 The record-holding two-time National Basketball Association champion reflects on his work ethic, his on-the-court friendships and rivalries, the great teams he's played for, and what it takes to have a long and successful career in this thoughtful, in-depth memoir.Playing in the NBA for eighteen years, Ray Allen won championships with the Boston Celtics and the Miami Heat and entered the record books as the original king of the three-point shot. Known as one of the hardest-working and highest-achieving players in NBA history, this most dedicated competitor was legendary for his sharp shooting. From the Outside, complete with a foreword by Spike Lee, is his story in his words: a no-holds-barred look at his life and career, filled with behind-the-scenes stories and surprising revelations about the game he has always cherished.Allen talks openly about his fellow players, coaches, owners, and friends, including LeBron James, Kobe Bryant, and Kevin Garnett. He reveals how, as a kid growing up in a military family, he learned about responsibility and respect—the key to making those perfect free throws and critical three-point shots.From the Outside is the portrait of a gifted athlete and a serious man with a strongly defined philosophy about the game and the right way it should be played—a philosophy that, at times, set him apart from colleagues and coaches, while inspiring so many others, and lead to the most pivotal shot of his career: the unforgettable 3-pointer in the final seconds of Game 6 of the 2013 NBA finals against the San Antonio Spurs. Throughout, Allen makes clear that success in basketball is as much about what happens off the court as on, that devotion and commitment are the true essence of the game—and of life itself.